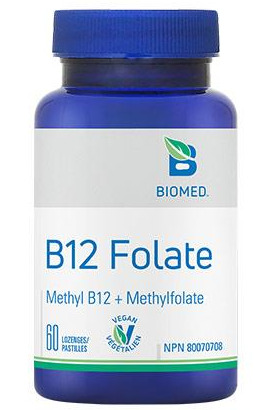 B12 Folate is a high potency vitamin B12 (methylcobalamin) and folate (L-5-Methyltetrahydrofolate, L-5-MTHF) formula. This quick dissolve sublingual lozenge offers rapid absorption of the biologically active forms vitamin B12 and folate into the bloodstream, thus bypassing several potential issues in the absorption cycle of the digestive tract. It is ideal for vegetarians and vegans. B12 Folate is used in cases of: preventing B12 and folate deficiency, anemia, and regulation of red blood cell formation; assisting in metabolism of carbohydrates and fats for increased energy; maintaining the myelin sheath and protecting against peripheral and central neurological disease and aging; supporting healthy nervous, cardiovascular and immune system functioning; pre and postnatal health; enhancing brain health, memory, and learning; and finally normalizing homocysteine levels, thus decreasing risk of heart disease and stroke.